Mulholland Restorations is committed to being acknowledged as leaders in this widely diversified field of Architectural Decorating, Restoration and Conservation of Painted Surfaces and has been restoring private and public buildings around Melbourne for the past 50 years. In addition to the best painting skills, our restoration services include plaster consolidation and replacement, carpentry requirements and minor general repair works (all related to producing stable and long lasting surfaces). Mulholland Restorations combines restoration trade skills and techniques to produce surfaces to any required standard, both internally and externally. Major commercial projects and ecclesiastical decorating are the main areas of business activity with particular interest in historical and period restoration. 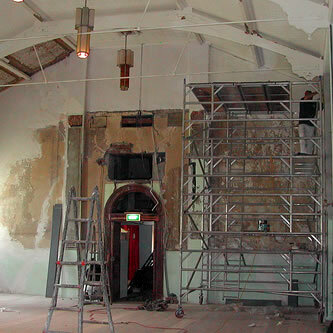 Church Restoration is a very broad field of work, and Mulholland Restorations have been extensively involved in many of Melbournes major church restoration projects – we can claim experience unmatched by others. From the spectacular Cathedrals of St. Patricks in both Melbourne and Ballarat, to the local church of St. Josephs in Collingwood, we have provided a service to both the church and the community by saving and preserving their cultural heritage. By making use of both modern and traditional materials & techniques we can revitalize and transform these beautiful buildings, or reinstate original finishes. We can also combine decorative treatments to meet today’s needs. Distinguished projects which have been proudly undertaken and successfully accomplished include the interior re-decoration of St. Patricks Cathedral and the conservation of the historic cedar ceiling and interior (incorporating the Ladye Chapel) at St. Francis’ Church, Melbourne.